Measures 4" x 2" x 1/2"
This is our smallest and most popular rechargeable silica gel canister. It is aneffective method of reducing harmful moisture in an enclosed area. The canister measures 4" x 2" x 1/2"and contains 40 grams of silica gel to protect up to 3 cubic feet. Durable aluminum construction. You will know the canister needs to be recharged when the orange silica gel beneath the heat-resistant inspection window turns dark green. To reactivate, place the entire unit (do not disassemble) in a 280 degree F oven for at 2-3 hours. 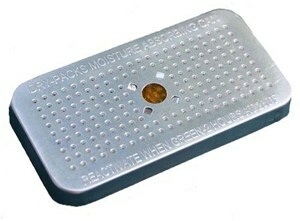 The silica gel will gradually turn orange again and be ready to absorb more moisture. For your convenience, the reactivation instructions can also be found on the the canister. The moisture indicator on the front turns from orange to dark green to let you know when the canister has reached its moisture saturation. Once it reaches its saturation, just toss it in your oven to recharge the canister. Canisters can be recharged as often as needed. A. It can be baked in your oven at 280 degrees. Multiple units may be dried at one time.